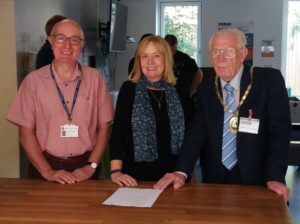 Dursley Town and Cam Parish Council hosted a joint launch event at The Vibe Youth Centre on Monday 17th September to mark the continuation of The Door Youth Project (The Door) as the youthwork provider for the area. The Door successfully runs community youthwork in Stroud, Stonehouse, Dursley, Cam, Wotton, North Nibley and Avening – promoting the concept of safe spaces for all 8-18 year olds across each of its centres and clubs. 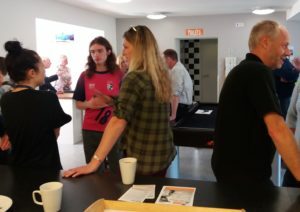 The Dursley and Cam youthwork team are especially excited to be continuing to host the youth clubs in Dursley and Cam, and have already put in place new sessions such as dedicated junior (11-13 years) and senior (14-18 years) club sessions and a monthly Saturday youth cafe for young people. Kathleen Hanbury, Community Youthwork Co-ordinator says ‘we are so excited to provide these specially tailored sessions as we know that this is exactly what the young people have asked for and will make good use of’.